Today we chat with 2010 Casa Grande grad, Jacque Taylor. During her high school career, Taylor finished in the top 5 at the cross country state championship all four years (9th grade-5th, 10th grade-2nd, 11th grade-3rd and 12th grade-1st). 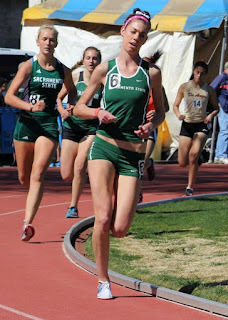 On the track, Taylor finished with high school personal bests of 2:17.05, 4:49.63 and 10:34.39. She competed for the University of North Carolina and eventually transferred to Sacramento State. 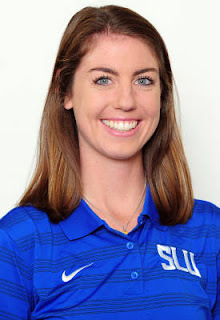 She started her coaching career at Ole Miss and eventually landed at St. Louis University where she coaches today. 1) How did you get your start in running and what was your experience prior to HS? Personal records before HS? From the age of 6 until my senior year of high school I played competitive soccer. It was in the 5th grade that a family friend started the “Sonoma Mountain Running Club,” which was running a mile after school every Friday. I raced every Friday after school (unless I had a soccer tournament) and was fueled by beating the boys and getting faster every week. I remember “promoting” from the 6th grade having run low 5:20 miles, and 8th grade racing to a 5:08 1600m. I also competed in USATF meets. 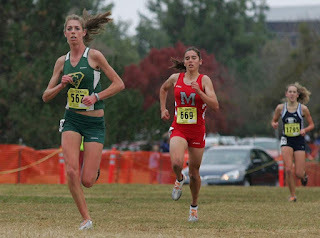 2) What were some of your highlights from your freshman year in hs in both XC and TF? Who were the runners that you looked up to as a freshman whether on your team or not? My big highlight from my freshmen year has to be placing 5th at the cross country state championships and placing 4th at CIF State Track in the 3200m with a time of 10:34. 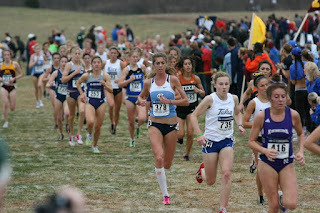 I would say I mostly looked up to Jordan Hasay, Christine Babcock and Alex Kosinski. 3) What were some of your highlights and proudest achievements from your HS career for both sports? 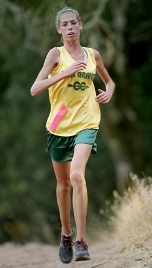 Highlights and greatest achievements in high school would have to be breaking 4:50 in the 1600m, running 16:56 xc 5k, competing for Team USA (NACAC) and winning a cross country state title (below in 2009). 4) Looking back at your high school training, what do you feel worked for you and what do you wish you did differently? Looking back on my high school career the two things I would change or do differently would be running more miles and adding some strength into my routine. I graduated high school with 30mpw at my highest and not able to do a single push-up... whoa! 5) You chose the University of North Carolina after Casa Grande HS. What led to that decision and how many other colleges were considered as well? I did choose the UNC for college. Truthfully, I had no intention of going to UNC. It was my very first official visit and I knew immediately that I wanted to be a Tar Heel. The atmosphere in Chapel Hill is amazing; intoxicating. I was also offered a full athletic scholarship (see Q12). The following week I took a visit to University of Washington but didn’t believe it to be the right fit. Right when I got back from Seattle, I verbally committed to UNC. 6) What was your experience at UNC and why did you end up transferring to Sacramento State? I spent a year and a half in Chapel Hill and loved every moment. Chapel Hill still holds a very large place in my heart—it is where met my lifelong friends. However, as much as I loved UNC, I needed to transfer to a school closer to home. Going into college I found out that I had Tuberculosis. I had to take medicine for close to 6 months. The medicine was very harsh and caused multiple health concerns, for example, peripheral neuropathy, anemia, trouble breathing turning my lips blue and strange food allergies (I had a Hitch moment chugging Benadryl in the grocery store) etc. The neuropathy got to the point where I remember spilling soup on an electric stove and I grabbed a regular towel to clean up and I didn’t feel a thing. I didn’t have much feeling in my hands and feet for about 3 years after taking the medicine. On top of that, my mileage was bumped up significantly where for 3 weeks I was running 100mpw. I ended up getting 2 stress fractures at the same time. Between getting sick, injured and mentally not in it anymore it was time for me to focus on me and transfer. 7) Highlights and proudest achievements at Sac State? After transferring from UNC in the winter I didn’t attend Sacramento State until the fall of 2013. After my transfer, I didn’t start training again until April. First off, I still wasn’t 100% cleared and was told I could run at my own risk. Secondly, I needed time to fall in love with the sport again. Unfortunately, when I did decide to get back into training to prepare for xc , I broke my foot. Immediately after it happened I went to get an x-ray where I was told that it was too swollen for a clear x-ray and I was cleared to run once the swelling goes down. So I kept running on it for a couple months but it was never getting better so I went back in for an x-ray where they told me it was broken and I was put in a boot for a month and a half. However, after that month and a half, my foot healed incorrectly and required surgery. I went through with the surgery and things were good for a while until I came to the conclusion that surgery didn’t fix it like I had hoped. My foot was always bruised, swollen and painful to walk. The entire time at Sac State I was dealing with the side effects from the tuberculosis medicine. To this day my foot is covered in arthritis and I need a joint fusion in my foot. So very long story short, I didn’t run much at Sacramento State because I was always rehabbing or trying to get my body healthy. I do have to give a special shout-out to Kathleen Raske, Scott Abbott and Joe Eby for believing in me, knowing my past and making me love the sport again. Not many highlights and achievements at Sac State that I am super proud of but it is the place I found out I wanted to get into coaching. 8) What led you to coaching and how did you end up at Ole Miss and now St. Louis? I’ve had many coaches in my time whether it was skiing, soccer or running. I’ve had amazing coaches and I’ve had coaches who I hope I never see/hear from again--they are the reason I want to get into coaching. The soccer coaches who would call me after a big race or would pick my brain for their upcoming 10k, the running coaches who supported me in all my good or bad decisions, the coach who scolded me after conference in front of everyone or made me cry in their office. I have been able to experience the best of both worlds and I have learned what I believe works best and what doesn’t. How you treat your athletes will affect them years after graduating and leaving the sport behind. 9) Who were the coaches that had the biggest influences for you and what were the most important lessons you learned from them? The coaches that have influenced me the most have been Connie Price-Smith, Head Coach at Ole Miss and Ryan Vanhoy, Head Women's and Mens Distance Coach at Ole Miss. For those who don’t know, Connie served as Team USA Women’s Track and Field coach at the 2016 Rio Olympics, was elected to the USA Track & Field Hall of Fame in 2016, currently serves as the President of the U.S. Track & Field and Cross Country Coaches Association, and is a four-time Olympian. She is the reason why I want to be a Head Coach at a Power 5 school. She is a quiet lady but at the same time speaks volumes. Ryan Vanhoy is the reason why I ended up at Ole Miss. I knew him back at UNC where he was the Graduate Assistant. I consider Vanhoy as my family, as he has always been there for me no matter what. He probably taught me 20 things a day and is still teaching me from another state. He taught me a lot about the sport but a lot about myself as well. He is a big-time mentor for me whether he realizes it or not. 10) Now that you have the perspective of a high school and college athlete as well as a college coach, what do you feel are the keys to being a successful high school runner? What about the collegiate runner? I think the key to be a successful high school and collegiate runner is to be consistent in training. Make sure you are constantly doing the little things, listening to your body, staying healthy. Know how to push the boundaries within yourself and do not compare your training to anyone else. Runners are notoriously known to be in their own heads and you need to stay out of it as much as possible. 11) What would your advice be for a high school coach who interested in coaching at the collegiate level? For a high school coach looking to get into college coaching the biggest thing I would say would be not to limit your opportunities. Go to your local college and ask if you can start as a volunteer. An opportunity is an opportunity and you have to attack it. The college coaching community is a tight one so once you get in you need to make the best of it. Anything I might add, I have things! Having gone from a college athlete to a college coach I believe I hold some quality insight for high school athletes looking to run in college. First off, take 5 official visits!! It will be one of the smartest things you will do during your senior year of high school. You need to keep your options open because you never know what is out there. Don’t be blinded by scholarship money. Whether it is a small offer or a larger offer, coaches can always increase and decrease. Being a college athlete is a big deal, it is fun and you meet many amazing people but you have to remember it is a job and it comes with expectations, especially if you are on scholarship. I really like this interview! As a high school runner, I love learning advice from those who have already been through it. I also enjoyed hearing her story about running in college, so please continue interviews with alumni. Glad you liked it. If you search through the athlete interview archive, you will find other interviews with past high school runners. If there are other runners that you would like to see interviewed, feel free to add them below. This is a great interview. I would imagine its an intimidating process when college coaches are recruiting and putting pressure on the recruits. (its their job on the line) Nice to hear a coach who says max out your 5 visits. The middle picture is of Taylor 3-5 meters ahead of Julie Nacouzzi for the CIF title at Woodward Park.I'll always remember watching the finish unfold as Taylor was about 2 meters behind Nacouzzi with about 300m to go and Nacouzzi elected to stay on the dirt/grass while Taylor hopped down onto the concrete and sped by her.A great race! !